Sustainability and paper: what are your options? Print has undergone major change over the past few years, with companies now faced with a host of new challenges from ever-demanding customers. One of the key trends to emerge in recent times is the call for more sustainable print, with more consumers looking to do their part and protect the environment. For the print service provider (PSP), this can mean huge changes throughout the print production service. From investing in more efficient machinery that uses less electricity, to recycling waste materials, there are several ways companies can enhance their ‘green’ image. Here, we focus on how the choice of paper can not only satisfy customer demand for sustainable printed products, but also place your company in a new light and cut your own carbon footprint. Antalis is one of the leading names in paper manufacturing that is committed to developing new products with sustainable features. Matthew Botfield, corporate social responsibility manager, said it is more important than ever for PSPs to look at these papers, citing a stat that 33% of consumers now choose to buy from brands they believe are doing social or environmental good. Botfield admits the pressure is on also PSPs to demonstrate how paper and print, once perceived as being harmful to the environment, are a greener option than digital media. He gives two examples: first, displaying a page for three minutes on a screen consumes more energy than producing a printed version of that page, and second, sending 20 emails a day over one year emits as much CO2 as driving 1,000km by car. “It is important to point out that paper is one of the few products which is completely sustainable and that the paper industry is actually one of the biggest users of renewable energy,” he said. To support this, Antalis has developed the ‘Green Star System’, which rates each paper with a star according to its environmental performance. Ranking high is the Cyclus range of 100% recycled paper, made exclusively from recycled fibre yet boasts a superb quality and texture, according to Botfield. Caption: Antalis has developed the ‘Green Star System’ to rank its papers with a star, according to its environmental performance. “To showcase its environmental credentials, consider that using one tonne of Cyclus Offset 100% recycled paper instead of virgin fibre paper saves the equivalent of 1,231kg of landfill, 3,794 kWh of electricity, 29,800lof water, 2,000kg of wood and 295kg CO2 and greenhouse gases,” Botfield said. For large-format substrates, Antalis has added Xanita, an ultra-lightweight and sustainable composite fibre-board solution. Made from recycled cardboard boxes, Xanita board is a 100% repulpable engineered, closed-cell fibre-board, manufactured with a corrugated kraft core. Botfield said: “Its advanced design technology has rendered the product lightweight yet robust, making it a perfect alternative to single use plastic POS materials. Botfield went on to outline Antalis’ ongoing commitment to sustainable paper production: “With a significant proportion of Antalis’ global turnover deriving from paper-based products, we are a business that relies heavily on natural resources. Recognising that 80% of the world’s biodiversity lives within forest areas, one of the key priorities within our CSR agenda is to ensure responsible sourcing of our products, thus encouraging the circular economy. Antalis works in partnership with Arjowiggins Graphic on product development, and scoring five out of five on the Green Star System is Cocoon. Developed by Arjowiggins, this is extra-white, 60 and 100% recycled, Forest Stewardship Council (FSC)-certified paper is engineered from high-quality waste office paper sourced locally from the UK and France. The range covers all types of applications and printing technologies. Like Antalis, Arjowiggins is committed to working with its customers to help them identify the sustainable paper best suited to their business. Virginie Gohlinger, operational marketing manager at Arjowiggins, said the company is focused on bringing to market new solutions that limit the use of natural resources and reuse materials, while at the same time reduce waste. All papers from Arjowiggins are certified by both the FSC and European Climate Forum, while the company’s mills comply with the ISO 14001 Environmental Management standard. Arjowiggins opts for alternative materials in its papers, such as fast-growing, renewable bamboo fibres and by-products from the food industry. Casting the net a little wider and Fedrigoni, which specialises in fine papers, is also placing a focus on sustainable products. Chiara Medioli, global marketing director, said the company has seen a sharp rise in demand for such papers and expects this to rise further as customers seek to improve their environmental image. Medioli said: “Our commitment is to produce even more consistent, eco-friendly products. This means improving production processes with less impact on the environment, meaning energy saving, reduction of water consumption, waste production and emissions into the atmosphere. Fedrigoni only uses wood sourced from sustainable forests that comply with strict FSC standards in terms of traceability and controlled wood origin. The company has taken this a step further by obtaining the ISO 14001: 2004 Environmental Management System to showcase it sown green credentials. 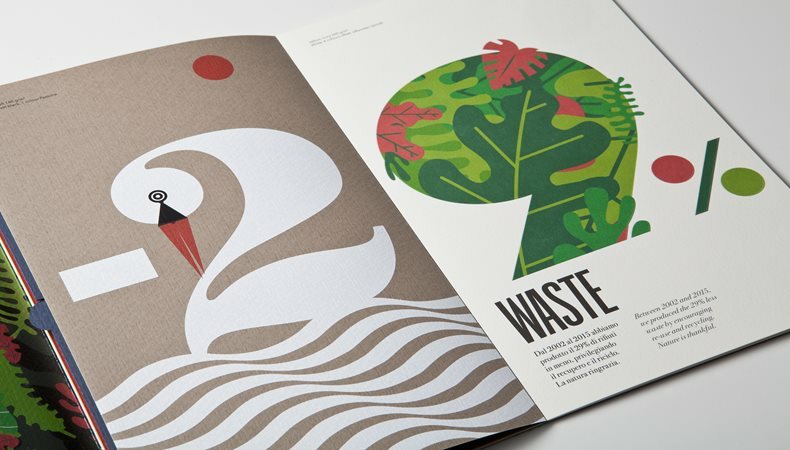 In addition, due to its commitment to using all recyclable waste from production, Fedrigoni has been able to develop a new, sustainable paper product in the form of Freelife’. Elsewhere, Innova Art also offers a range of high quality papers, with a focus on fine art and photographic digital inkjet media. David Williams, global supply chain and quality manager, said as federal and regional regulations regarding the use of paper continue to strengthen, demand for sustainable products will grow. Caption: Innova Art said that all of its activities in terms of manufacturing paper are consistent with environmentally friendly practices. Pictured: Innova Editions, available in roll and sheet formats. Williams added: “This will require manufacturers to make more environmentally friendly products. Large, multinational companies will insist on their supply chain having these types of products. With this in mind, Williams draws attention to the latest paper product on offer from Innova Art in the form of Eco Solvent Poster Art Paper 210gsm. Available from the first quarter of 2019, this paper is made from sustainably sourced alpha cellulose fibres, a water-based ink receptive coating, and designed to work with all modern eco-solvent and latex printers. Whichever way you look at it, sustainability should be a key consideration for all modern print businesses. Customers’ demands and requirements are leaning more towards greener solutions and, in order to keep hold of these clients and ensure repeat business, you should consider switching your own focus to ensure you can deliver what they want. As well as assisting your customers, switching to more sustainable production methods will mean you are helping the planet. The environment has been a hot topic for some time now, with various groups, politicians and influential figures urging companies to change their ways and limit damage to our surroundings. Using sustainable paper products will go a long way to ensuring forests, and the wildlife that flourishes in them, will survive for many years to come.